Summary: This is not Eastwood's finest film, but its still a well made and moving film, and a fascinating and true story. If Barack Obama has a difficult task, how much harder must Nelson Mandela’s (Freeman) have been in 1994? Recently released from prison, not in the best of health, estranged from his wife and family, reviled by many of his countrymen and facing the frankly awkward task of pursuading the unhappy populace to unite behind the banner of his new South Africa. How does he do it? Well, maybe not in the way you might expect. 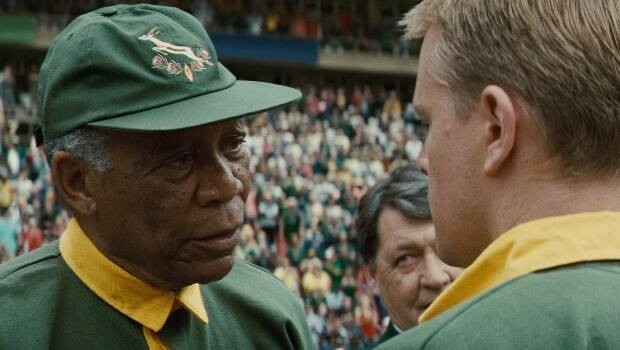 The key to Mandela’s genius, according to Eastwood, was his understanding of his enemy. Trapped in a tiny cell on Robben Island, Mandela observed his captors; learned them, understood how their brains worked and most importantly, their fears. In an early scene, we see Mandela reassuring his (mostly white) staff that no-one is going to lose their job; later we see the friction between ex-special branch members and Mandela’s new (mostly black) bodyguard, victims working with possible torturers and somehow learning to get along. This is a microcosm of the film as a whole. Black South Africans are excited about ditching the hated Springbok gold and green; Mandela refuses and instead decided to make the rugby team the focus of the nation’s energy for the forthcoming world cup. Rugby in South Africa was the game of the Afrikaner; Mandela is determined to turn this around and to this end enlists the help of the young team captain, Francois Pienaar (Damon, transformed into a roineked Afrikaner by the magic of protein shakes). Mandela asks him to tea, charms him, and co-opts him. The team, pariahs of world sport during the apartheid years, are only in the world cup because they are the host nation; it is assumed that they don’t stand a chance. Can the underdog team and the nation’s most wanted terrorist turned president pull off a sporting coup? Well of course they can! But the rugby is here, as in all the best sporting films, a metaphor for something else. The world cup is a perfect moment, a potent symbol; the outcast nation turning the world on its head and in the process bringing former enemies together. I don’t even like rugby, but you don’t need to know or care about sport to understand that this was history being made. When the mostly white, mostly Afrikaans speaking team stand on the field and sing the new South African national anthem, Nkosi Sikelel’ iAfrika, the die is cast. Both leads are excellent; Morgan Freeman captures all of Mandela’s dignity, humanity and warmth, though his accent is sometimes a bit dodgy. Its also a shame that sometimes Madiba, as he is known, seems to speak in homilies. But portraying someone so famous must be hard. Damon has an easier time with the less well-known Pienaar, his initial doubts melting away as he comes to understand the mind of the new President, particularly after a visit to the (real) cell where Mandela was imprisoned for eighteen years. This is not Eastwood’s finest film, but its still a well made and moving film, and a fascinating and true story.